A prized Hereford stands at the Old Fort where demonstration gardens and farm plots helped homesteading families learn new skills and techniques for farming. The Fort Lewis College mens gymnastics team practices on the turf at the Old Fort. 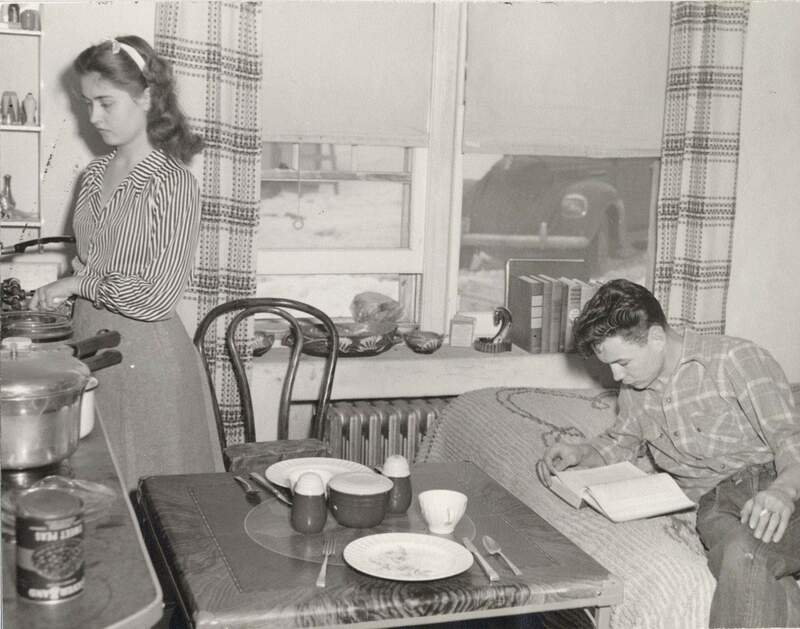 Married student housing at the Old Fort for World War II veterans included 20 cramped housing units. 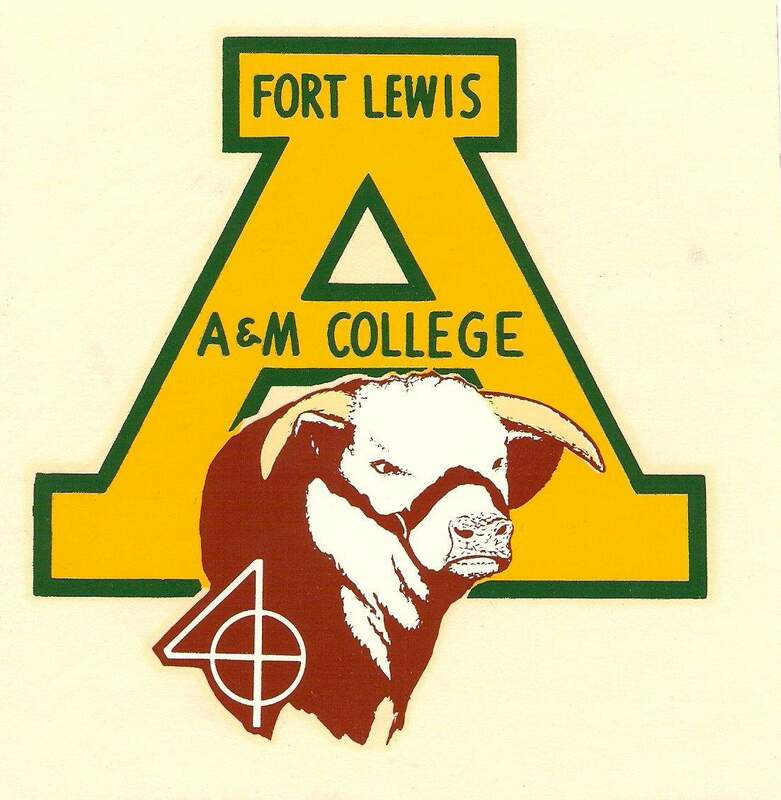 The original logo for Fort Lewis A&M Junior College. 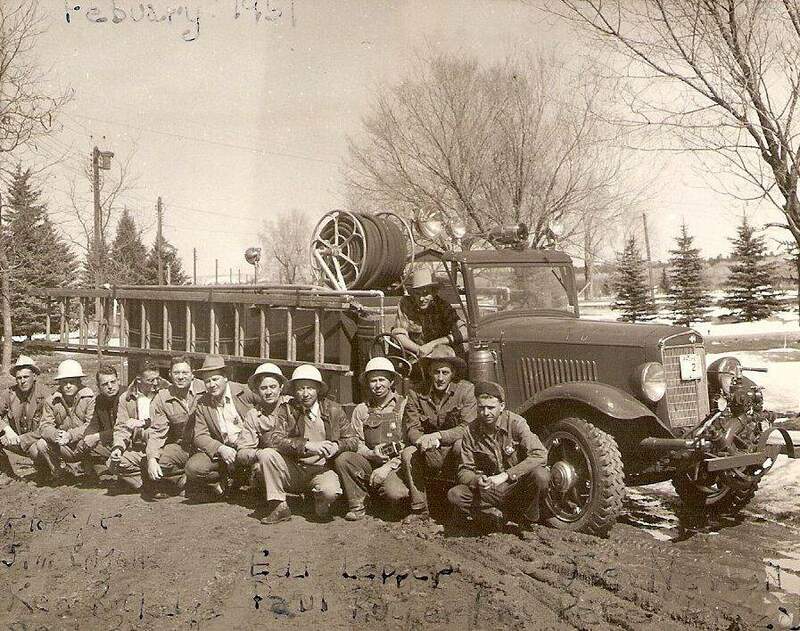 The Fort Lewis Mesa fire crew in front of their fire truck February 1951. Springtime mud season at the Old Fort could last for months. Ray Horvath, bus driver, stands on the right in front of the Forts pride and joy  The Mighty Moo bus, which took student athletes all over the state if only they could get out of western La Plata Countys mud and snow. OLD FORT LEWIS  In La Plata County, settlers and farmers took up homesteads near historic Fort Lewis. Four generations later, some of those pioneer families remain, and they have a warm and intimate relationship with the Old Fort. This summer, as Fort Lewis College celebrates its 100th birthday as an institution of higher learning, the colleges activities and those of Fort Lewis Mesa will be combined. For a quarter century, at the Fort Lewis Mesa Community Reunion every five years, residents and old-timers get together, swap stories, tell jokes about each other, and remember the days of rutted dirt roads, outhouses, hauling water and praying for rain. The Fort Lewis Mesa Reunion will hold activities at the Fort Lewis Mesa School, Marvel, Redmesa and Breen on July 1 and 2 to bring together families from Southwest La Plata County. On July 3, Fort Lewis College will sponsor an Old Fort alumni picnic complete with tours of the historic buildings. The stories will flow just like the iced tea and lemonade because its a long, shared history unique to this corner of Colorado. The 1862 Homestead Act opened the West for settlement and development, and the law stated that any head of household could take up a homestead of 160 acres. You didnt have to be a white male, and you didnt even have to be an English-speaking American citizen. Thousands of immigrants from within the United States and from foreign countries came to the American West to bet Uncle Sam they could live on their plots for five years, farm, fence and start families. Though the Ute reservation line crosses just south of Hesperus, in 1899, Congress opened Southern Ute lands for homesteading. To Southwest La Plata County came Lithuanians, Norwegians, Welsh, Austrians, Germans, Italians, Spanish, French, Hispanics and brothers from Missouri. They came to claim their slice of sagebrush and to eke out a living between the coal mines near Durango, the gold and silver mines in La Plata Canyon and Silverton, and their own small farms. They grubbed out the sagebrush, the piñon and juniper. 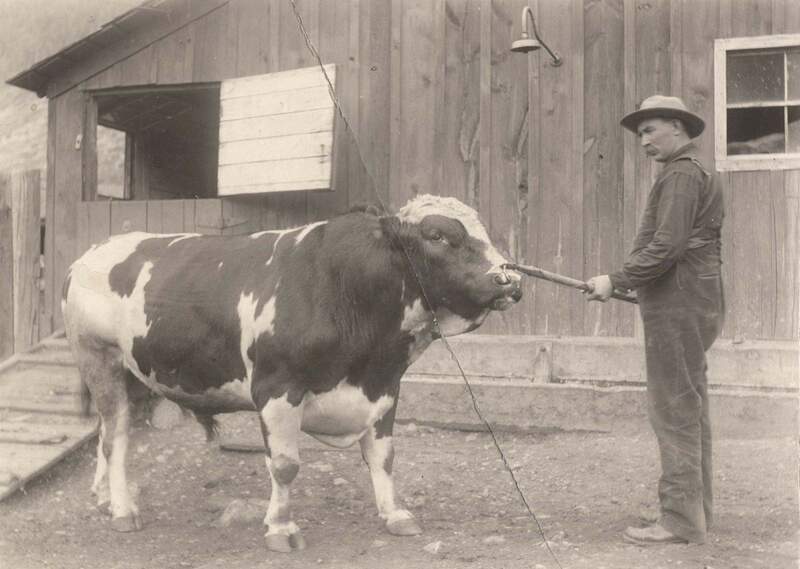 They raised chickens, sold eggs, milked cows, set fence posts and ran Herefords. As part of becoming Americans, their children attended one-room schools, learned to say the Pledge of Allegiance, fought in the schoolyard and rode horses home. Settlers loved President Teddy Roosevelt, who frequently used the African proverb Speak softly and carry a big stick. So in 1907 ,they named Big Stick Mesa and used teams of horses and fresnos to dig the Big Stick Ditch, which diverts water from the La Plata River. Surely La Plata pioneers carried more shovels than walking sticks because the Big Stick Ditch irrigates almost 2,000 acres. Homesteading families included the Slades, Oldfields, Pauleks, Huntingtons, Atencios, Aspaases and Eldridges. Mormon families came to the Redmesa area, and equidistant between Kline and Breen a county road corner with 13 mailboxes became a local landmark with the nickname Tin Can Corner. Pioneers helped each other with haying, harvesting, thrashing dryland wheat and looking for lost cows. As dryland farmers, if two years out of five you got more than your seed back, you did alright. Wages were cheap but so were prices. In 1920 four lots in Marvel could be purchased for $110. Rather than be starved out by the Great Depression, families survived on potatoes, pinto beans, garden produce and deer taken during farmers season or any time a healthy buck got too close to a farmers field at sunset. Although we had no electricity for years, and no indoor bathroom or plumbing, we had a wonderful childhood and never realized that we might be poor, Evelyn Brady Slade recalls. From the beginning, these pioneer families had a special relationship with Fort Lewis. As it evolved from an American Indian boarding school to a public high school (1911-1933), they sent their children there. College classes were offered concurrently starting in 1927. Staff at Fort Lewis High School showed silent movies for mesa residents, and county fair exhibitors set up in the gymnasium. And when the high school began to offer college classes at what would become Fort Lewis A&M Junior College after 1933, farm families sent their children there, too. For Cattlemens Day at the Fort Lewis picnic grounds, a local rancher would donate the beef. 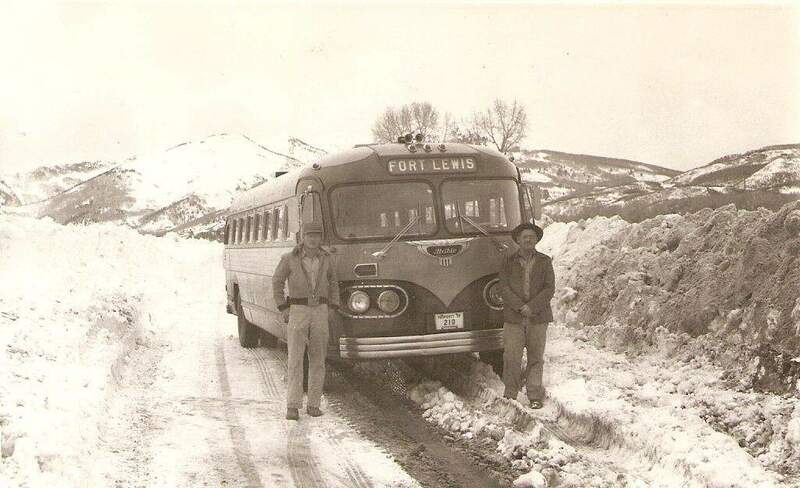 The pride of Fort Lewis Mesa was the fire truck kept at the Old Fort, and as the college prospered, local families hired on as cooks, maintenance men and bus drivers for the colleges famous school bus nicknamed The Mighty Moo, which ferried athletes to far-flung competitions  provided the snowdrifts werent too high. Connected to local families and supporting the Fort Lewis Mesa community, college administrators improvised on tuition. The ties that bind are deep in this part of the county. 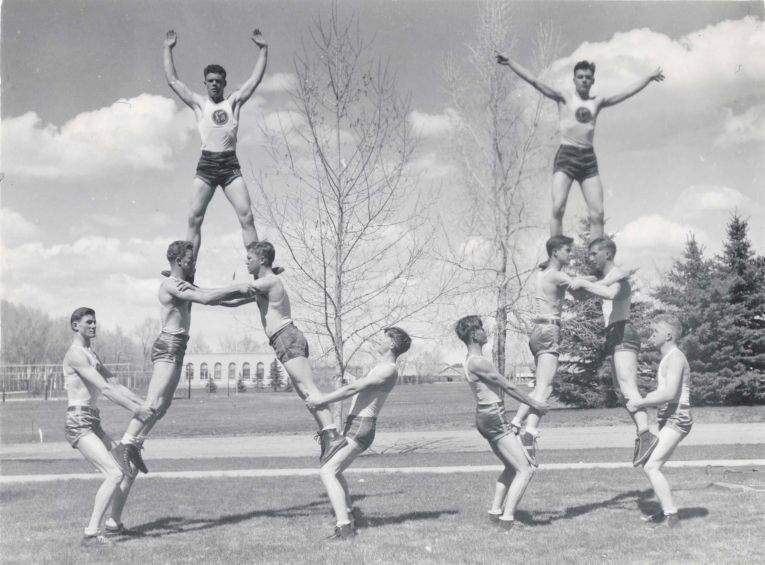 Even though Fort Lewis College moved to town in 1956 and now has one of the finest campuses in the West, the colleges roots are in that dryland soil. In early July, come to the Old Fort. Listen to the stories about how a college and a community grew up together. An education, after all, is just another kind of seed that carefully tilled, brings forth fruit for a lifetime. gulliford_a@fortlewis.edu Andrew Gulliford is a professor of history at Fort Lewis College. The Fort Lewis Mesa Community Reunion is July 1-2. Attendees are asked to pre-register. For more information and a complete schedule, visit tinyurl.com/flmreunion or call 588-2223. 9 a.m. to 4 p.m.  history fair. Sessions feature speakers representing Old Fort/Ridges Basin/Breen, Hesperus/Mayday/Thompson Park, Hay Gulch/Big Stick, Alkalai/Cherry Creek/Dryside, Picnic Flats/Marvel/Kline and Redmesa/Long Hollow. 10 a.m. to noon  genealogy workshops at Redmesa Church, 6848 Colorado Highway 140, Hesperus. 11:30 a.m. to 4 p.m.  tours of the campus includes hayrides and walks.